Formula 707® LifeCare® Hoof Health is now available in Daily Fresh Packs! Nourish and improve cracking, crumbling or delaminating hooves. 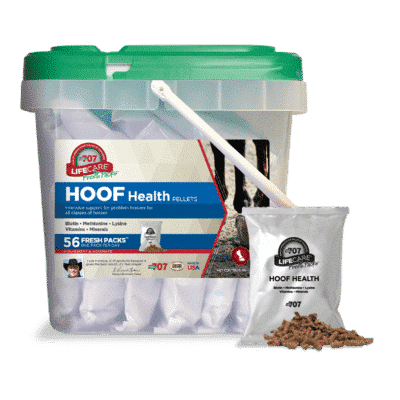 COMPLETE support for strong, healthy hoof walls and soles. D-Biotin (a B vitamin) supports thick hoof wall and sole growth. DL-Methionine and L-Lysine (essential amino acids) are vital for overall hoof quality. Proteinated manganese, calcium, phosphorus, zinc and copper maximize bio-availability and absorption. 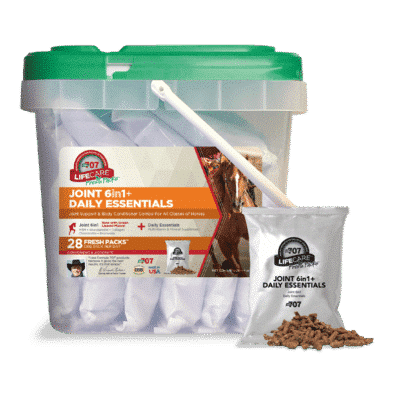 Poor quality hooves can lead to eventual lameness, and the condition of a horse’s hooves are an indication of your horse’s overall health and nutritional state. 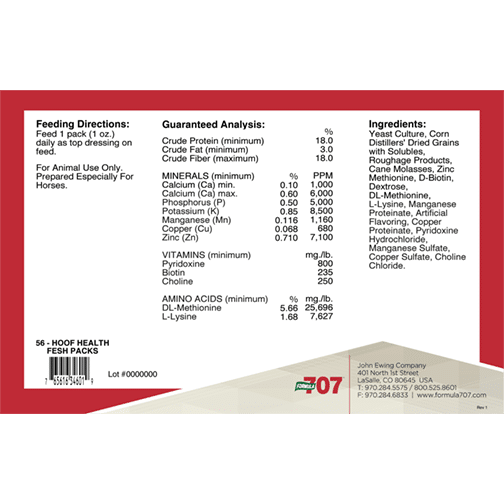 Each serving of Formula 707 Hoof Health contains D-biotin (a B-vitamin vital to hoof health), DL-methionine and L-lysine (essential amino acids), plus minerals calcium, phosphorus, zinc methionine complex, and proteinated manganese and copper to maximize bio-availability. 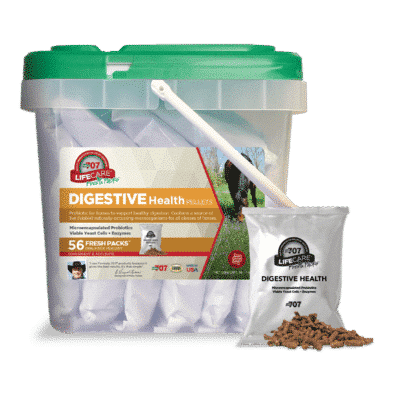 All of these nutrients are blended in a base of yeast culture, dried distilled grains and rice hulls, making Hoof Health the most balanced product of its kind. You’ll see results in just a few weeks, and dramatic improvements in just a few months.